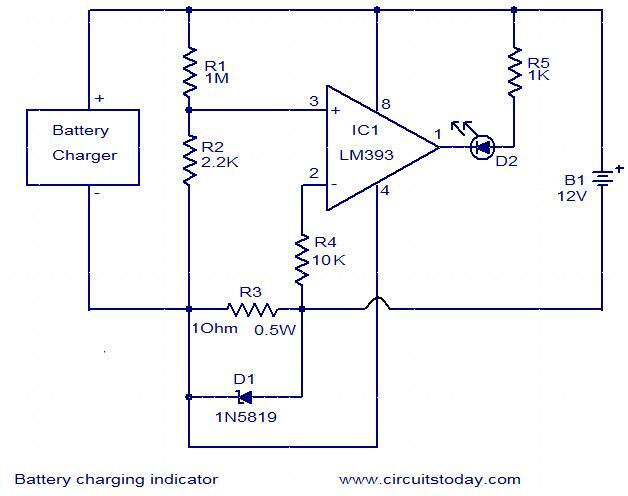 This simple circuit can be used to monitor whether a battery is charging or not. The voltage comparator IC LM393 is the heart of this circuit. The LED D1 will remain ON whenever there is at least 25 milli ampere current flowing to the battery. This particular circuit is designed for a 12V battery with charging current less than 1A.By slightly modifying the component values, the charging current and voltage can be modified. Do not use this circuit with batteries has more than 1A charging current. Hi sir can you please tell me that how to check amperes of battery that my battery charging current is not more than one ampere ? sir I want to build this circuit for 3.7 volt mobile bettry…plz tell me how I change this circut for 3.7 volt….?? sir i had noticed your ckt diagram of battery charging indicator for12V 1Amp.my question is how to identify which components is used to replace the existing component for 12V 7Amp charging. Dear sir, is it right to use 1N5822 diode instead of the one you have mentioned in your circuit (i.e1N5819). I am using 6v 4.5ah SLA battery, will this circuit stop charging at 6.9v or 7.00v. i have used 220k for R1 and when the LED will go off, in this case it should go off at voltage level of 6.9v or 7v. But i am doubtfull sir that it will not go off. please explain …..
Dear Bashir the indication will go off, when the charging current falls below 25mA. 1N5819 rated for 1 amp, will do but you can use the 3 Amp rating 1N5822 also. This circuit does not sense the voltage level of the battery. for a proper cut off use a voltage regulated power supply between 6.9 to 7 volt with a charging capability of 1 amp. I have a unit that charges at only 10 to 20 ma and I am using a 16 volt power supply to charge the batteries (10 AAs). Could you tell me which components I would adjust to handle this lower charging current and higher voltage? can u please help us with the block diagram of battery level indicator using Lm3914. Can u help us with schematic diagram of the circuit. hi, please help me. if i want to use this circuit for the current more than 1 ampere (example 3 ampere). what can i change? I WANT TO MAKE BATTERY CHARGER WITH LAMP CONNECTED CKT. ALL COMPONETS & AMPS RATING AND APPARATUS REQUIRED FRO THIS. Pls what is D1 in these charge indicator stand for? Is it zener or ordinary diode.And if it is zener,what is its voltage rating? Hi Sugiman you can use the test circuit for 0 to 5 volt by adjusting the reference for 4 volt. use R1 1.2k and R2 2.7K. Hi Sugiman this can be used with any battery up to 30 volts. you can set the current such that it show up to trickle level or it can indicate just whenever the battery is connected for charging (called mandatory charge indicator) please go through my 19th July comment for calculation to use with other battery voltages. Hi sugiman sorry i have forgotten to send the site details. This is the circuit you can use in dot indication mode or bar indication mode. you can go through National semiconductor LM3914 datasheet for full details. Hi Sugiman you can use LM3914 10 segment level display. you can use rectangular different colour LEDs to indicate the appropriate battery level. Hi Praveena PD across R2 is 12 X (2.2/1000) that is 26.4mV. to get the same mV across 1 ohm you have to flow 26.4mA. if you reduce the battery voltage to 6volt 4.5AH the current for trickle is approx 45mA. hence 60mA is preferred value hence 60 X1 = 60mV. 60mV across 2.2K hence for 6 volt it is 220k. (switching off of LED indicates battery is fully charged. if you want still indication even the charge is than trickle use say 25mA. then 25mV across 2.2K for 6volt. 528K nearby preferred value is 510K. Hi Praveena Reduce R1 to 220K for 6 volt. What are calculations or values for 3, 4.5 or 6 volt batteries? I mean values for R1 to R4. I believe R5 would stay the same. Why must we use 25 ma for min charge current? I am assuming this works without regard to battery(NiCad, NiMH or LiIon) type except they must be the rechargeable type? i neeed circuit for charging battery using LM393 and not many components.